The 915 KF Ti-Touch is the Karl Fischer version of Metrohm’s new stand-alone titrator for routine analysis. Just as in the 916 Ti-Touch, the buret, stirrer, dosing system and operation module of the 915 KF Ti-Touch are cased in single, compact unit. This is not only handy but also saves valuable benchspace. The Ti-Touch is available in multiple configurations that are ready to use right out of the box! The Ti-Touch is also available in a base model that you can add the electrode and burette of your choice to. 915 KF Ti-Touch – The next big thing in KF titration is small! Straightforward automation of applications with 814 and 815 Sample Processor. Generate forge-proof PDF reports and save them on a USB stick or in the intranet. USB interface for printer, USB stick or barcode reader. Up to 14 methods can each be linked to a favorite icon on the touchscreen. Methods start at a single touch. All system components are instantly recognized and ready for use. Overflowing of the titration cell during conditioning is prevented in the 915 KF Ti-Touch due to the «safety stop»-feature. If, e.g., the electrode has not been connected correctly or there is moisture in the titration cell, conditioning stops automatically after a short time or after a certain amount of Karl Fischer reagent has been added. 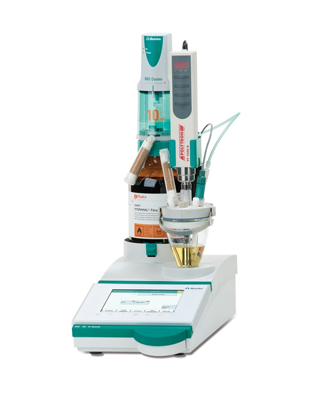 The 916 Ti-Touch is the new compact titrator for potentiometric titration. 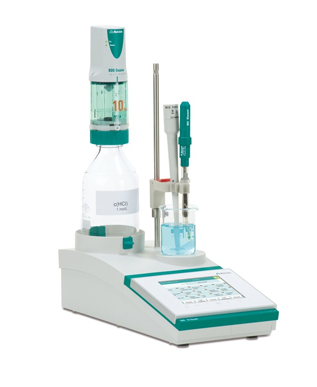 The instrument supports the following titration modes: DET (dynamic equivalence point titration), MET (monotone equivalence point titration), SET (titration to one or two given endpoints) and MAT (manual titration). The new compact titrator comes in the versions 916 Salt Ti-Touch, 916 Oil Ti-Touch and 916 Food Ti-Touch, which are all-inclusive packages containing the titrator plus the complete accessories for the respective applications. 916 Ti-Touch – The next big thing in titration is small! Save methods and results directly in your intranet or LIMS. Up to 100 samples can be determined unattended (with 814/ 815 Sample Processor). 2 MSB (Metrohm Serial Bus) ports for connecting up to 2 800 Dosinos or 805 Dosimats, 2 Magnetic or Rod Stirrers and 2 Remote Boxes for automation.